– or a watery scene that may make you look twice before realizing that the water is not about to rush in through your window! 1. If you’re redecorating from scratch, or if you’re starting with an empty room, consider starting your interior design plan or decorating with your choice of a 3D wall art vinyl wall sticker, and then creating and decorating around that vinyl wall sticker, having everything match up with the 3D window frame view wall sticker, rather than trying to find a suitable 3D window frame view wall sticker to fit in with the rest of the room decor. 2. Make use of a room decor theme to match up with your new 3D wall art sticker fake window. If the 3D window frame wall sticker gives a view of a beach, use beach house decor ideas for the room. If the 3D window frame wall sticker gives a view of the countryside, use rustic or country style decor ideas for the room. 3. Create a confusing but interesting effect by decorating an entire one side of a room (or even the whole room if you like) to create the illusion of being outside a home (or office building or other building. The confusion is created by expecting to see the outside of a window at the far side of this outdoor illusion, but instead the 3D wall art window frame sticker on the far side of the room gives a view of a beach, the countryside, or any other outdoors view. So. while really being inside, one creates the illusion of being outside a building, that has a “window” view of something that is also “outdoors”. a) Is there a river or dam in the scene, that “comes right up to your wall”? Extend part of that river or dam into the house by creating a water feature beneath the wall sticker. 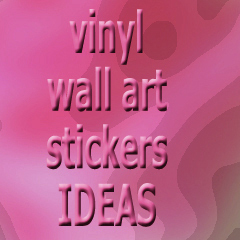 b) Extend part of a tree or branch that appears in the vinyl wall sticker window “view” by placing a real potted tree to the side of the wall sticker. c) Place beach finds and sea sand beneath a vinyl wall art sticker beach scene, so that it appears as if the beach is spilling over from the 3D wall art picture into your room. Introduce deck chairs, a sun umbrella, a picnic table for the sun downers cocktails, and potted indoor palm trees. A blow up play pool on a waterproof surface and an indoor kiddies sandpit could be added if the 3D wall art beach view sticker is on a wall in a playroom or child’s room. Of course add brightly colored plastic buckets and spades too. Let your imagination run wild with 3D wall art stickers window frame views. Go on relaxing holidays without leaving the room.